To kick start activity in your community, we recommend adding a few topics to each of your categories. This article describes how to add a topic. As the owner or moderator for your community, you can either post a new topic from within the Community (the members area) or from within the Moderate area. Posting from within the Moderate area provides a few additional capabilities, so we will cover that in this article. Go to Admin > Moderate and click Add new. Enter a title, description and select a category to post into. To add images or file attachments, drag and drop them onto the topic area. You can add video from YouTube, Vimeo and Wistia. Click the video icon and paste the link to your video. Click Save Draft to save what you have and continue editing it later. After saving the draft, click Preview topic to preview it in the community. Click Publish to post the topic in the community. 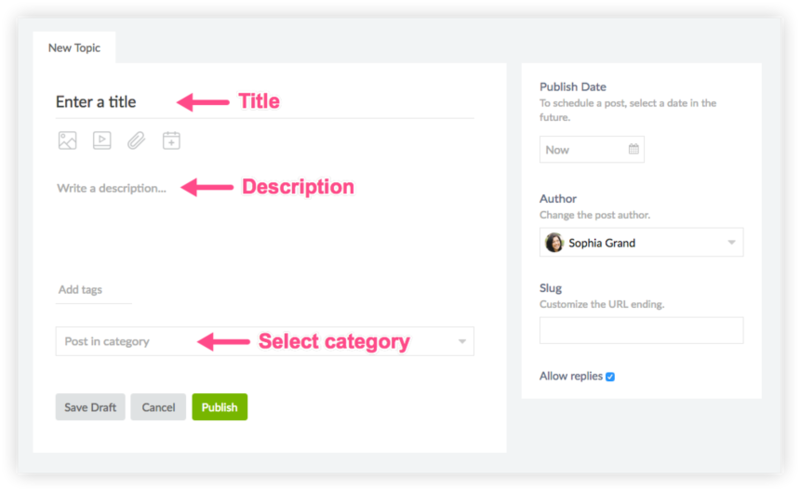 After publishing, click View topic in the side column to view it in the community. To edit a topic after publishing, click the cog icon and select Edit. Make your changes and click Save. To anchor the topic to the top of the category above all other topics, click Pin. Hello, I'm testing ForumBee for our organization and love your platform. Is this something you'd be able to customize for us? Hi Michelle , thanks for your question! The edit link is available to members for the time limit you have specified in Admin > Settings > Posts. The default is 15 minutes for replies, but can be changed there.